Vincenzo Montella urged Sevilla to come out fighting and finish the season on a high after Saturday's Copa del Rey final drubbing at the hands of Barcelona. Sevilla were thrashed 5-0 as their winless run in all competitions was extended to eight matches, with that dry spell coming on the back of a memorable 2-1 Champions League triumph at Manchester United. A season that once held the prospect of European and domestic glory, as well as a top-four finish, is now threatening to come completely off the rails. 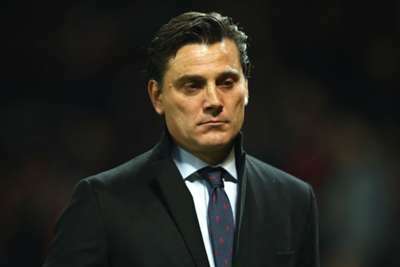 With five league games remaining, Montella's side face a battle to secure Europa League qualification and the Italian is desperate to see a reaction from his players. "We're not in our best run of form. It happens to some teams, but now we have to react," said the Sevilla coach. "Will the dressing room lift itself? I think so. We'll go back to work with more strength and focus. "We have to end the season well. Reaching a final in Spain is very difficult and we did it, reaching the Champions League quarter-finals too. "Now we have to end the season in the best way possible so we can play in the Europa League next year." Friday's trip to Levante is next up for Sevilla, who sit eighth, just a point ahead of Girona.